The westbound California Zephyr sped across the high plains of eastern Colorado, the train’s headlamps piercing the early morning darkness. In the cab of the first diesel engine, the engineer blew a warning signal as the train approached a crossing – two long blasts on the horn, followed by one short, then one long. Jill McLeod had just entered the Silver Banquet, the dining car. She paused in the corridor that ran alongside the train’s kitchen and turned toward the nearest window, her face reflected in the glass. Then, outside the train, twin headlights glowed. Silhouetted in the lights from a nearby building was a pickup truck, stopped at the crossing. Then the lights, building and vehicle disappeared as the train passed. Breakfast service aboard the California Zephyr started at six o’clock in the morning, and it was a quarter after the hour. Jill walked down the corridor past the kitchen to the main part of the Silver Banquet. This early in the morning, few of the tables were occupied. Jill nodded to several early risers. Near the center of the car, the steward, Mr. Taylor, stood behind a curved counter. Behind the steward, a doorway led back to the kitchen, a hub of activity this morning. 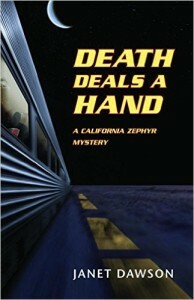 She took the window seat at a table for four, facing toward the train’s engine. Jill didn’t need to look at the menu. She marked her meal check, choosing a favorite breakfast. A waiter approached her table, carrying a silver coffeepot. “Good morning, Mr. Gaylord,” Jill said. From the conductor on down, the crew were expected to keep their communications with their fellow crew members on a “Mister and Miss” basis. “Coming right up.” Mr. Gaylord moved away from the table, heading for the kitchen. Jill reached for the heavy silver pitcher and poured cream into her cup. Then she raised it to her lips. Ah, the coffee tasted good. And the caffeine jolt was most welcome. She usually slept well on the train, but she’d had a restless night. Yesterday, Jill had reported for duty an hour before the California Zephyr, designated train number 17, was due to leave Chicago’s Union Station. She’d been in the Windy City for two nights, a layover following her eastbound run from Oakland to Chicago on train number 18. Now she was returning home, to California. When Jill arrived at Union Station, she stowed her suitcase and first-aid kit in her compartment at the end of the Silver Chalet, the buffet-lounge car. Then she began her pre-departure routine. She walked through the train from beginning to end, checking the washrooms for cleanliness. Each car had a card holder, and in these, she inserted cards identifying her as the Zephyrette. The train’s consist – the rail cars that made up the train – began with three diesel locomotives owned by the Chicago, Burlington & Quincy Railroad. Following the engines were cars built by Pennsylvania’s Budd Company, a mix of equipment from all three roads. The legend California Zephyr decorated the sides of each car and the gleaming stainless steel cars all had “Silver” in their names. This was why the California Zephyr was known as the Silver Lady. Before the train’s 3:30 P.M. departure from Union Station, Jill and the Pullman conductor, Mr. Winston, stood at the check-in tables inside the station, greeting passengers and directing them to their cars. Jill also made dinner reservations for people traveling in the sleeper cars. Once the train left the station, Jill went to the public address system in the dining car, where she’d made the first of several announcements she would make during the westbound journey. After that, she’d walked forward through the train to the three coach cars, where she began making dinner reservations for those passengers. She’d made another announcement as the train crossed the Mississippi River at 6:30 P.M. and headed into Iowa. After the dining car closed later that evening, Jill made her last announcement of the day on the train’s PA system, which was located just opposite the steward’s counter. After making her announcement, Jill walked through the train once more, stopping to talk with passengers. Many were settling down in their seats and sleeper berths, ready to turn in for the night, although seats were still occupied in the Silver Chalet’s coffee shop, which served hot food, snacks, and beverages. There were a few people in the lounge, where a waiter served liquor and non-alcoholic drinks. Both venues would be open until 10 P.M.
Jill went back to her compartment at the rear of the Silver Chalet. The narrow space contained a bench seat that folded down into a bed, as well as a toilet and sink. The washstand pulled down from the wall and pushed up again when not in use. Inside the compartment, she took her suitcase down from the overhead rack and opened it, reaching for her soft blue cotton pajamas. She undressed and put on the pajamas, then stowed the suitcase on the rack. She pulled the sink down from the wall to wash her face and brush her teeth. She pushed it back up, letting the water drain into the pipes in the wall. Then she converted the seat into her bed, climbed under the blanket, and plumped the pillow. Jill didn’t go to sleep right away, though. First she worked on her trip report, which she was required to file at the end of the train’s fifty-one-hour journey. The report was an account of each day’s activities, a journal of the ordinary things that happened on the run, as well as anything out of the ordinary. She prided herself on the details in her trip reports, and she kept a small notebook and pencil tucked in the pocket of her uniform, making notes during the day. Her trip reports usually included comments about the number of dinner reservations she’d made the first day out, any troublesome or special-attention passengers, children traveling alone or any baby-sitting that she’d done for passengers with small children, medicine she had administered, although that was limited to giving passengers soda mints to relieve motion sickness, or treating minor scrapes and cuts with supplies from her first-aid kit. It seemed that no matter which run she was on, there was always a child who stumbled on the stairs or got a finger caught in a door. Jill finished this first day’s portion of the report, adjusted her pillow and settled back into bed. The hardbound book propped on her lap was the newest Agatha Christie novel, Funerals Are Fatal, and Jill was eager to start chapter one. She read for a while, absorbed in the workings of Hercule Poirot’s little gray cells, accompanied by the steady and familiar click-clack of wheels on rails and the occasional burst of laughter coming from the lounge in the middle of the car. Finally she yawned and put down the book. It was half past nine. Tired after a long day, Jill dozed off almost immediately. Then she woke up, not sure how long she’d been asleep. What had awakened her? Raised voices, just the other side of her door. She sat up in bed, turned on the light, and looked at her watch. It was just after ten. She listened to the voices, trying to make out words. A man and a woman, and they were having an argument, though Jill couldn’t figure out why. The man’s voice became louder, more insistent, and there was a thump, as though someone had bumped against Jill’s door. That was followed by the sound of flesh striking flesh.